The owners of this San Diego vacation home appreciated the home’s amazing location and ocean views, but the home’s interior did not reflect their lifestyle. 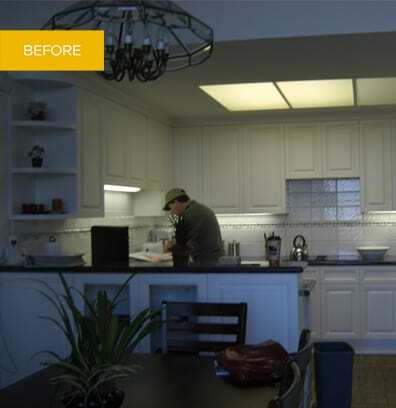 The kitchen was designed with an inefficient layout, outdated appliances and insufficient lighting. 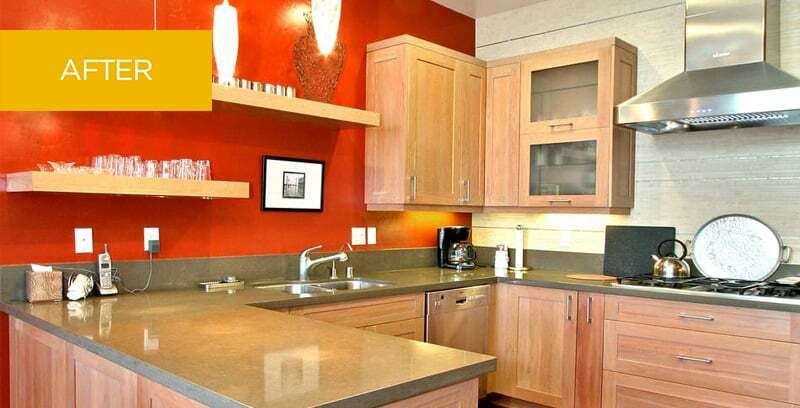 Art lovers who travel extensively, the clients desired a kitchen with a contemporary attitude. They wanted to live surrounded by vibrant colors and modern products in a visually exciting environment where they could showcase their art collection and entertain friends. The first design decisions about the space were structural. After the removal of a step up into the dining room and the elimination of a 5′ soffit in the kitchen, the kitchen and dining area now allow for unobstructed movement and full appreciation of the ocean views. A rich crimson wall defines the sophisticated color palette, ranging from subtle cherry cabinets to a deep gray quartz countertop. The back wall of the kitchen communicates an Asian influence, with an interlocking, matte finished pattern of porcelain tiles. Stainless steel appliances, linear hardware and bold, artistic lighting amplify the room’s contemporary aesthetic. A walnut engineered wood floor throughout the entire downstairs of the home now provides a rich gleam of continuity. The owners are thrilled with their new kitchen environment, which serves as a beautiful backdrop for the artwork they have collected during their global travels. They now eagerly anticipate visiting their vacation home and sharing their home with friends.